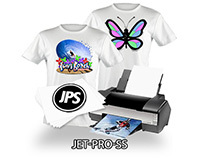 Neenah JET-PRO SS Inkjet Heat Transfer Paper is easy-to-use, images well, is easy to peel, won't bleed and images remain sharp and crisp. For white and light colored fabrics. This transfer paper has the least “hand” or feel. Works well on cotton, cotton blends and synthetics garments. 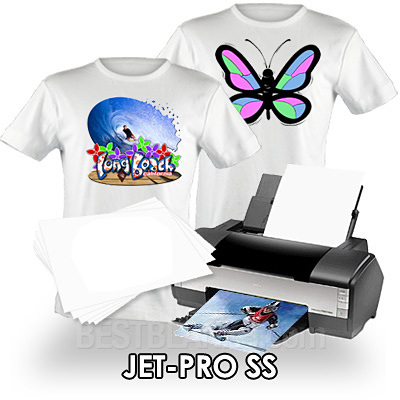 The graphic is printed on the JET PRO®SS with a reversed image on an inkjet printer. The transfer is placed face down on the garment and heat pressed with heavy pressure for 30 seconds at 375°F. Immediately peel the backing paper from the garment. For the best “hand,” stretch the garment while hot. This product can be peeled warm or cold. Can also be hand ironed but using a heat press produces more consistent and quicker results and is highly recommended.